Recently, we shared data on contributions by District residents to three different causes identified on tax forms. How about charitable giving in general? In 2012, 109,000 tax filers in the District – about a third of all filers—reported contributing $744 million to charitable causes that are exempted from federal taxation. District residents collectively gave away 4 percent of their incomes. More than a quarter of the tax filers who gave had incomes above $155,000—the threshold for the top ten percent of income in our city. The top-ten-percent collectively accounted for 61 percent of the giving. Nine out of 10 highest income earners gave to charitable causes. Even the poorest in the District gave, but in smaller numbers and proportions. Nearly 2,000 District residents with annual incomes under $15,000 gave a combined $3.3 million for charitable causes. On average, tax filers, gave about $6,825 (a filer could be single person, a couple, or a family). 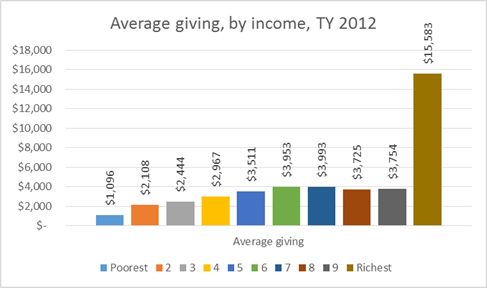 Average giving is remarkably stable across the middle of the income distribution, varying between $2,000 and $4,000 per filer. Giving among the richest tax filers on the other hand was $15,500 per filer. The great recession affected charitable giving. Total giving declined from its pre-recession peak of $811 million in Tax Year 2008 to $630 million in tax year 2010. This is a 22 percent decline. We are yet to catch up with that level, but more tax filers are giving today than any other time since 2006. This is another way of saying more filers are itemizing. So how do we compare to the rest of the country? We give more than average Americans do, but not nearly as much as we earn. 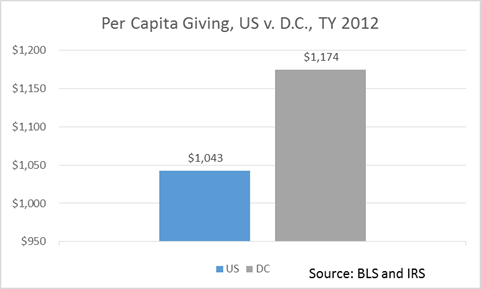 Per capita giving in the District (averaged across all District residents, and not just tax filers) is 1.12 times the national average at $1,174 per year, but our per capita income is 1.71 times the national average. Tax filings do not reflect all charitable giving. The National Philanthropic Trust reports that 95.4 percent of American households give to charity. 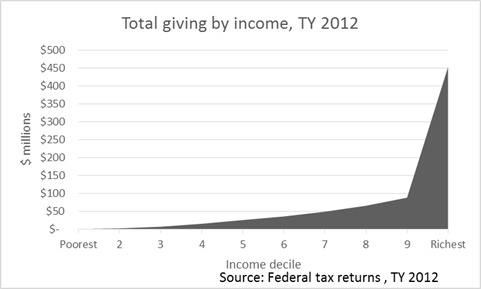 Tax filings underrepresent that figure, especially at the lower end of the income distribution because filers who do not itemize their deductions have no reason to report their charitable giving. Next > What is happening to the District’s middle class? It would be nice if the data was represented as a percent of income for the Average Giving by Income and Total Giving By Income. We’d expect, in an absolute dollar value basis, that the richer would give more. If represented as percentage of income, I wouldn’t be surprised if it showed that the 8th and 9th deciles give more as a percentage of their income then the top decile.